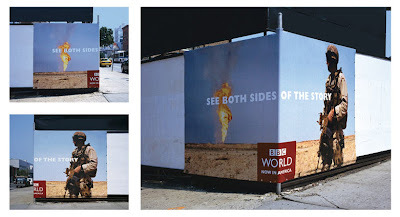 These outdoor campaigns from BBC Americas are pretty good examples of two different approaches when it comes to creativity. 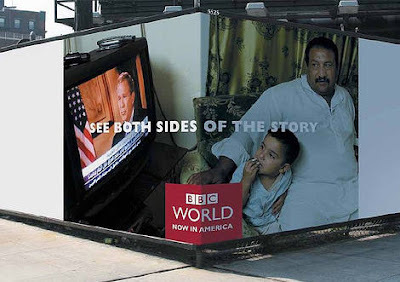 While the first campaign -"Corners"- shows clearly that there are always ways to give a creative twist to the "same old, same old" billboard that consists of an image, a copy and a logo, the second campaign ("Interactive") illustrates how much can still be done by creatively mixing new technologies with traditional media. 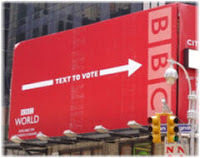 One is a simple idea that just plays with the location factor, the other is a truly interactive billboard that allows the public to "vote" via texting, and express their views on current political and social affairs. The interactive ones, on the other hand, won several very well deserved prizes from the London International Awards (among others). 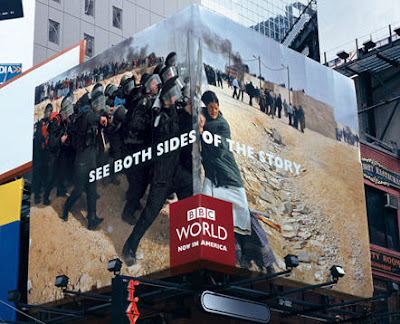 Located in Times Square and with a big "news worthy" image on the center that is flanked by two very different opinions, it entices viewers to decide with which opinion they agree with, using their cell phone to express that opinion. 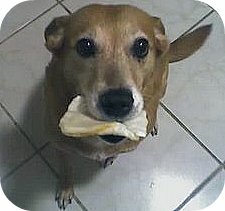 The agency is BBDO NY and the creative lesson is pretty clear: if you think hard you can always do something new with old formats...or you can create your own format by combining old and new in a different way!